In the picture you can see the processes of color conversion, from dark to light shades. Here are collected difficult to match colors and their location. In the center of the picture depicts the image of a woman with amazing plasticity. The flowing lines of her silhouette demonstrate her femininity. She is dressed in an Indian sari with a subdued orange color. From it radiates the universal energy of life force. Black hair is picked up and laid and covered over a cloth of dark blue color – a symbol of the mind. An ornament is seen on her wrist, perhaps this bracelet is a symbol of protection. She is barefoot, which can be dealt with with freedom and independence. The facial features are blurred, but in them determination is guessed. Her large eyes are very highlighted. A woman is represented in the image of life itself, and her dress speaks of India itself. 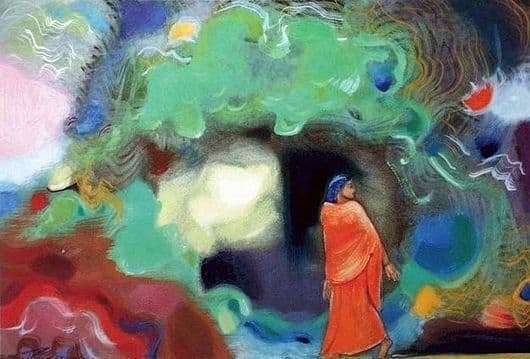 Perhaps for Roerich, India is the very house he thinks about, loves, remembers and honors. A woman is moving forward, this can be judged on the location of her figure, limbs and the turn of the body itself. Around her, the process of renewing life is incessant. This is indicated by the colors surrounding it. She moves along the yellow path, saturated with the echoes of the solar deity. She is in a continuous process of life renewal. It goes from darker tones to brighter and brighter. Behind her is a dark past, ahead is waiting for a wonderful future. Her gaze is fixed back into the past, as if in thought to take something good out of him. Behind the female image there is supposedly a window into the unknown infinity. Inside the window, life processes rage, presented in a variety of colors. Many green streams, made in a cyclical form, as if separating and protecting space. Green color symbolizes the plant world and radiates the joy of the whole picture.